Description: In these chapters, a group of renowned international scholars seek to describe Paul and his work from �within Judaism,� rather than on the assumption, still current after thirty years of the �New Perspective,� that in practice Paul left behind aspects of Jewish living after his discovery of Jesus as Christ (Messiah). After an introduction that surveys recent study of Paul and highlights the centrality of questions about Paul�s Judaism, chapters explore the implications of reading Paul�s instructions as aimed at Christ-following non-Jews, teaching them how to live in ways consistent with Judaism while remaining non-Jews. The contributors take different methodological points of departure: historical, ideological-critical, gender-critical, and empire-critical, and examine issues of terminology and of interfaith relations. Surprising common ground among the contributors presents a coherent alternative to the �New Perspective.� The volume concludes with a critical evaluation of the Paul within Judaism perspective by Terence L. Donaldson, a well-known voice representative of the best insights of the New Perspective. Citation: A. Chadwick Thornhill, review of Mark D. Nanos and Magnus Zetterholm, eds., Paul within Judaism: Restoring the First-Century Context to the Apostle, Review of Biblical Literature [http://www.bookreviews.org] (2016). 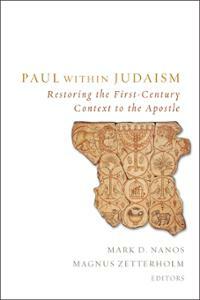 Citation: Mark M. Mattison, review of Mark D. Nanos and Magnus Zetterholm, eds., Paul within Judaism: Restoring the First-Century Context to the Apostle, Review of Biblical Literature [http://www.bookreviews.org] (2015).